« Does Success in September Carry Into October? 20/20 Vision: Sabathia Seeking Encore, but How Many More? Even though the value of wins has been somewhat discredited by the modern focus on sabermetrics, amassing 20 victories in one season remains a notable milestone for a starting pitcher. Since 1901, 476 different pitchers have started at least one game for the Yankees, but only 35 have made it to the 20-win mark. Included among that group is CC Sabathia, who recorded 21 victories in 2010. Apparently not content with one such season, the Yankees’ ace has been at it again in 2011. As a result, the big lefty takes the mound tonight with the chance to make it back-to-back years with 20 victories. Andy Pettitte 2 CC Sabathia ? The Yankees have had 15 different pitchers win 20 games in at least two seasons, so if Sabathia is able to notch a victory in one of his final three starts, he’ll join a list that includes Hall of Famers like Red Ruffing, Lefty Gomez, and Whitey Ford. What’s more, by winning 20 games in consecutive seasons, Sabathia would become a member of even more select fraternity that includes only 10 pinstriped hurlers. The last Yankees’ pitcher to win 20 games in consecutive seasons was Tommy John, who recorded 21 and 22 victories in 1979 and 1980. Like Sabathia, John was a coveted free agent who paid immediate dividends in his first two seasons in New York, but the Yankees are probably hoping their current ace sticks around a little bit longer. Less than two years after his historic accomplishment, John demanded a trade following the fallout from a confrontation with team vice president Bill Bergesch. Although the two sides would reunite several years later, John’s departure in August 1982 was acrimonious. Vic Raschi poses during spring training in 1948. That year, the young righty began a stretch of four consecutive seasons with at least 19 wins (Photo: Daily News). John’s circumstances in 1982 were unique. Not only was the left hander upset about being demoted to the bullpen despite pitching to a respectable ERA, but in response to his gripe, Bergesch implied that John was being ungrateful to the team that had treated his family so well amid a tragedy that occurred the previous year. Needless to say, should Sabathia exercise his opt out this off season, the negotiations are unlikely to come with similar baggage. 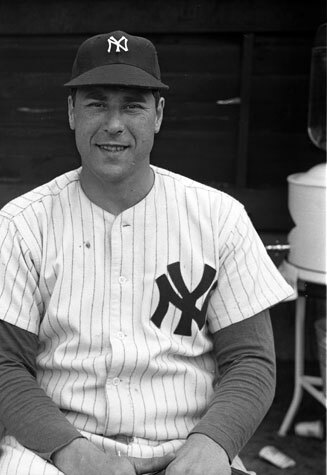 If Sabathia wins 20 this season and continues his tenure in pinstripes beyond, he’ll then be able to set his sights on Vic Raschi, who won 20 games in each season from 1949 to 1951. Raschi had also held the distinction of being the last Yankees’ pitcher to win at least 19 in three straight seasons, but Sabathia already wrestled that title away in August. Although there is some uncertainty regarding the Yankees’ future relationship with Sabathia, it isn’t a stretch to suggest that he has a chance to go down as one of the greatest pitchers in franchise history. Matching Red Ruffing’s four consecutive 20-win seasons might be a little too ambitious, but more than a few franchise pitching records could fall if the big lefty remains in pinstripes.